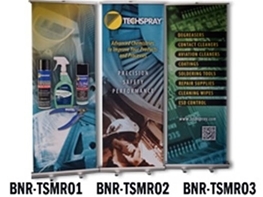 3 different Techspray banner stands that can be used as a full 10' x 10' backdrop or mix-and-matched for a smaller display. 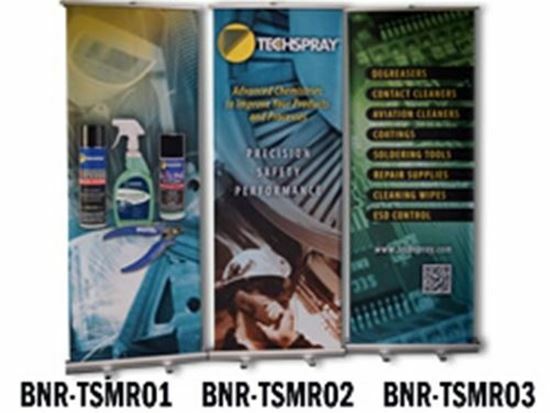 These were originally developed for the Grainger show, so designed for industrial / MRO type of events. Note: You are responsible for any marketing display materials that you order. Think of this like a library book and I'm that library detective from Seinfeld. Pack in up carefully as it was shipped to you, and ship it back to us promptly. Otherwise, I will find you!